It is in Kusdilli District in city center. 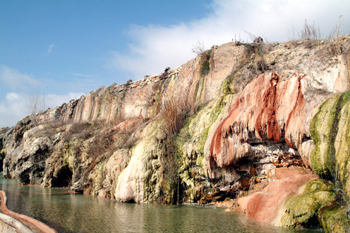 The terme geothermal area is one of the most important areas of Kirsehir. In the area, thermal tourism, commercial growing of hothouse flowers, vegetables and fruits and city heating are performed. There are many springs in this area. The wells which are in 92-500 m depth have got temperature between 30,3-57 celsius degree and flow between 5,2-88,5 L/Sec. Total flow of the nine wells are 349,8 L/Sec. -In hyper blood-pressure, chronic bronchitis, the dermatitis of upper respiratory ways; positive results are taken. There are four tourist facilities established to offer service for whom wants to benefit from healing water of Kirsehir. These are five star Makissos Thermal Village that was situated 2,5 km far from city center. In thermal settlement there are total 201 rooms including 180 standard, 2 physically disabled, 18 suites and 1 king room, also there are 56 terrace house including 1+1 and 2+1, Three star Grand Terme Hotel with 132 room 264 bed capacity, Three star Temur Thermal Hotel with 79 room 160 bed capacity and Physiotherapy and Rehabilitation Center part of Ahi Evran University with 22 room 44 bed capacity.